With each new generation since we made the big jump to optical media, developers at some point will tell us how much more work the new generation of games demands. This time, Capcom has stepped up to bat. In an internal discussion at Capcom, translated by Siliconera, the developer and publisher's Senior Manager of Technology, Masaru Ijuin, said that "the amount of work involved in making games for next-gen consoles is eight to ten times greater than what is required for the current generation of consoles." For the Xbox 360 and PlayStation 3, Capcom used an engine called MT Framework, which they debuted with Dead Rising and Lost Planet. The team considered upgrading the MT Framework engine, but felt that "taking the easy route often fails to bring about the best results." Instead of reducing their newly inflated workload by half, they wanted to reduce it to just a sixth of what it would be on MT Framework. Creators will have to relearn the new engine, called Panta Rhei, but it comes with an expectation of a better end result. One of the main features is 'parallelization'. Normally when a game is made, the planner comes up with a plan, and the designer draws a map…The characters are then placed on the map and the created game is played. If the game's not fun, the map is redesigned from scratch. This is what you would call a serial process. On the other hand, Panta Rhei transforms this into a parallel process, thereby minimizing work loss through the coordination of efforts. MT Framework will still be used as the 360 and PS3 live out the last legs of their lives, but development is already occurring on Panta Rhei. 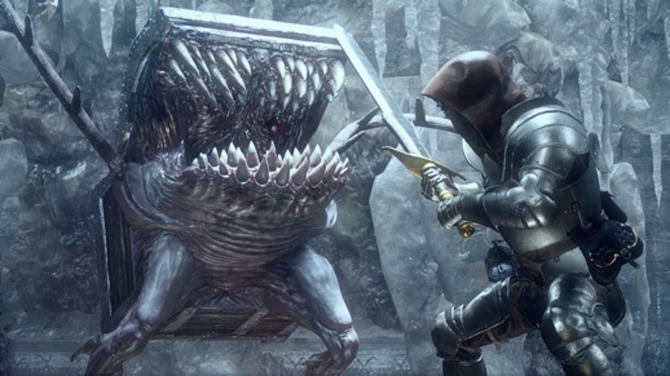 Deep Down, Capcom's much-anticipated dungeon crawler, is one of the big examples. The Deep Down team is communicating with the technology team to make sure they are consistently improving Panta Rhei for future development. This parallel development of an engine and a game on it, though, is just one of the reasons why the first round of console games from each developer feels like it needs some work or some polish. Often times, the engines that power these games, unless it's Unreal or Unity or something like that, aren't quite ready for production. They need real-world testing, and the time from console announcement to final devkits isn't always enough to finish up the engine. Here's hoping that Deep Down can still achieve everything it's setting out to do even with the hurdle of an in-progress engine.